Given the price, none whatsoever. I bought a pair of new ones for $60 from someone who received them as a gift and didn't seem to care what he got for them. One was still in a sealed box, one slightly used/abused. Couldn't resist the deal-- turned out way better than I could have imagined. At first sight, they are very cheesey feeling / looking, but there is nothing cheesey about how they perform. As the others have said, it leaves you totally surprised at how good it is. Properly set up and playing a good, clean record, it sounds excellent and easily beats a CD. I also have a direct drive Technics with a Grado black, and this one sounds as good or better. I'm totally convinced there is no reason to much more on a turntable other than the more expensive ones are fancier. Being totally plastic, and thus very light goes against everything you expect to see in a turntable, but that doesn't seem to affect sound quality and hey, it's less weight to lug around. Quality must be consistent, because this one has a very slight motor hum just like others have mentioned. You need a dead quiet room to hear it. -- Sony receiver (primarily meant to be for surround sound) with Sony cube speakers & sub woofer. Various turntables from various manufacturers. 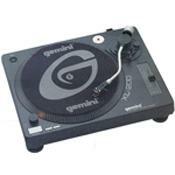 Cheap price for a complete working turntable. Can be a credible performer with a quality cartridge, and the arm is massive enough to run a Grado well. Good bass extension when it's all setup right - a pleasant surprise. Also keep the resale value in mind, and this is where this unit also does well as there is a used market for a clean one with box, etc. The cheap build will turn a lot of people away. Considering the price, I can't really complain. This turntable is almost an oxymoron – two opposites combined into one. Here we have a Technics SL-1200 series wannabee look-alike – but here presented in genuine 99% plastic – even the platter is molded plastic. Yet surprisingly, even with the cheap build and parts quality, it’s really not a bad performer at all. It’s as though the unit performs better than the sum of the parts – and is superior to the other cheap-o entry level turntables on the market. Out of the box, it has a basic cartridge which is dreadful – but actually is an acceptable compromise. It’s not a DJ cartridge, nor is it a respectable musical cartridge. It’s something to get you by until you install the right cartridge for your intended use. For me, I was looking for a dirt-cheap turntable to play my old LPs while on a back-to-college budget (and we are talking $75 for the entire system here). I bought this as I could not find a decent deal on a reliable classic used turntable. Too many sellers on eBay don't understand how to pack a turntable - or I would have rather gone with something like a classic old Pioneer PL-12 or the like - ditto on a used MMF-1 or 2/2.1. So I felt this would work and have respectable resale value when I do land something decent. I mounted a Grado in the arm, and it works surprisingly well. No, I would not want to archive LPs with it, nor crank the volume due to rumble, but it does it’s job. For the price, I can't ask for more. Many true audiophile turntables from the likes of Thorens, Yamaha, Music Hall as well as many audiophile wannabees from Denon, Pioneer and Technics along with countless Duals. Nothing else in this class worth owning . hardly noticable motor hum that can be heard standing next to it. I bought the table based on cost, yeah it was cheap, but I was trying not to spend away any more money than I already have. I've nearly spent 4 grand in stereo stuff these last few months. Anyhow I got it so that I could listen to some old records that I bought at the vynilmania in NYC's village, some 20yrs ago. I'm hooked on CD's but my records are rare, and can't be found in CD format. So how does it sound? It sounds great to me, except for the occasional pops that are inherent to records. The players better than can be expected for the cost, but it does have little motor hum that can only be heard when standing over it. The end result it’s a bargain!